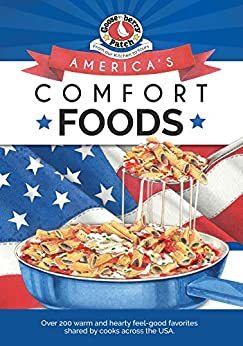 America’s best-loved comfort foods…over 200 unforgettable dishes from cooks coast to coast. You’ll find recipes for regional favorites like Philly cheesesteaks, Chicago deep-dish pizza, classic midwestern meat loaf, Kansas City ribs, southern fried chicken, Tex-Mex enchiladas, all-American apple pie and much, much more! From breakfast to dinnertime, with these family-pleasing recipes you’ll be serving up meals that warm tummies and hearts alike…snacks and desserts too!